Tamimi, who has already been held in custody for over two months, will plead not guilty to the anti-free speech charges against him before a military court. * Entry to the military court must be coordinated with the Israeli army’s spokesperson in advance. After more than two months in custody, the trial of Bassem Tamimi, a 44 year-old protest organizer from the West Bank village of Nabi Saleh, will finally begin Sunday. 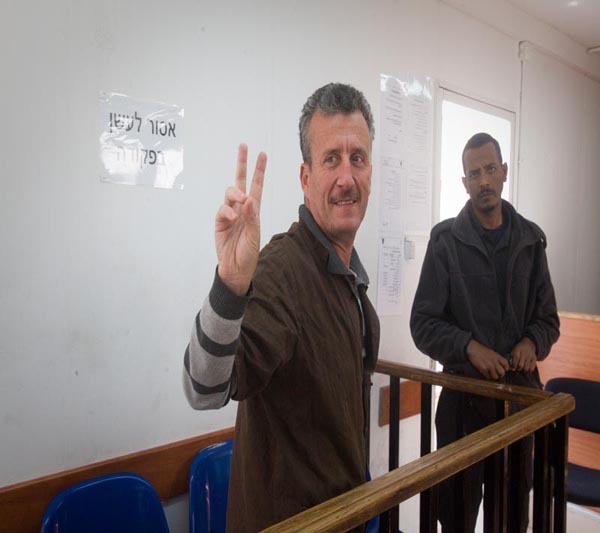 Tamimi, who is the coordinator of the Nabi Saleh popular committee, will plead not guilty to the charges against him. He will, however, admit to having organized demonstrations against settlement expansion and argue that it is i,n fact, the Israeli Occupation that should be on trial. Tamimi’s detention was recently extended indefinitely by an Israeli military court. The judge ordered him to be kept in remand until the end of legal proceedings. The indictment against Tamimi is based on questionable and coerced confessions of youth from the village. He is charged with incitement, organizing and participating in unauthorized processions, solicitation to throw stones, failure to attend legal summons, and a scandalous disruption of legal proceedings charge, for allegedly giving youth advice on how to act under police interrogation in the event that they are arrested. The transcript of Tamimi’s police interrogation further shows the police and Military Prosecution’s political motivation and disregard for the suspect’s rights under interrogation. 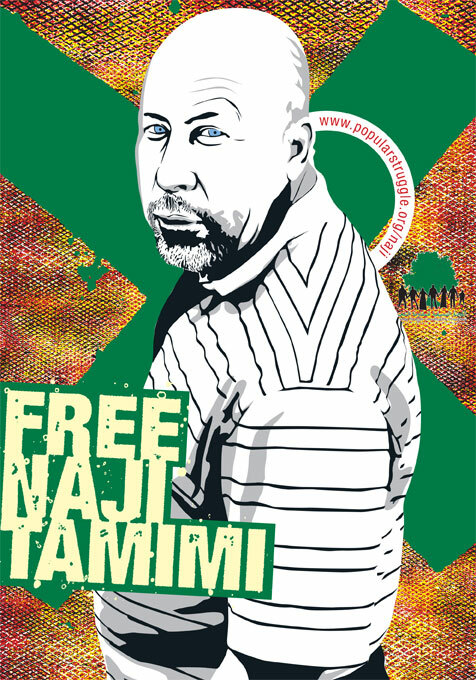 During his questioning, Tamimi was accused by his interrogator of “consulting with lawyers and foreigners to prepare for his interrogation” – no doubt a legal right. 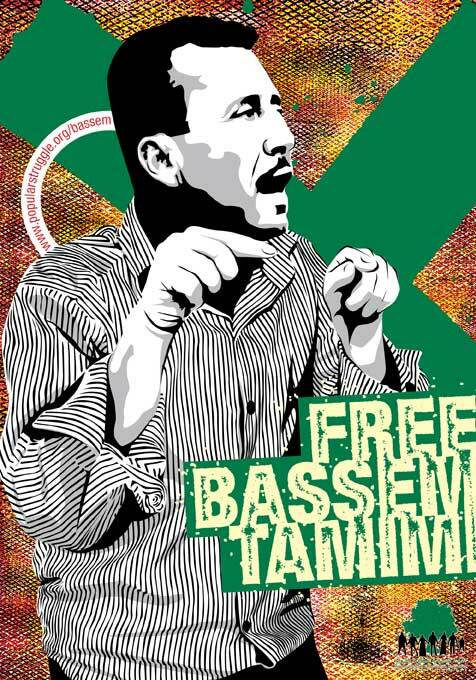 Bassem Tamimi is a veteran Palestinian grassroots activist from the West Bank village of Nabi Saleh, north of Ramallah. He is married to Nariman Tamimi, with whom he fathers four children – Wa’ed (14), Ahed (10), Mohammed (8) and Salam (5). As a veteran activist, Tamimi has been arrested by the Israeli army 11 times to date and has spent roughly three years in Israeli jail, though he was never convicted of any offence. He spent roughly three years in administrative detention, with no charges brought against him. Furthermore, he and his legal council were denied access to the “seceret evidence” against him. In 1993, Tamimi was falsely arrested on suspicion of having murdered an Israeli settler in Beit El – an allegation he was cleared of entirely. During his weeks-long interrogation, he was severely tortured by the Israeli Shin Bet in order to draw a coerced confession from him. During his interrogation, and as a result of the torture he underwent, Tamimi collapsed and had to be evacuated to a hospital, where he laid unconscious for seven days. As one of the organizers of the Nabi Saleh protests and coordinator of the village’s popular committee, Tamimi has been the target of harsh treatment by the Israeli army. Since demonstrations began in the village, his house has been raided and ransacked numerous times, his wife was arrested twice and two of his sons were injured; Wa’ed, 14, was hospitalized for five days after a rubber-coated bullet penetrated his leg and Mohammed, 8, was injured by a tear-gas projectile that was shot directly at him and hit him in the shoulder. Shortly after demonstrations in the village began, the Israeli Civil Administration served ten demolition orders to structures located in Area C, Tamimi’s house was one of them, despite the fact that it was built in 1965 and expanded already in the year 2003. On the March 24th, 2011, a massive contingent of Israeli Soldiers raided the Tamimi home at around noon, only minutes after he entered the house to prepare for a meeting with a European diplomat. He was arrested and subsequently charged. The main evidence in Tamimi’s case is the testimony of 14 year-old Islam Dar Ayyoub, also from Nabi Saleh, who was arrested from his bed at gunpoint on the night of January 23rd. In his interrogation the morning after his arrest, Islam alleged that Bassem and Naji Tamimi organized groups of youth into “brigades”, each with its own responsibility during the demonstrations: some are allegedly in charge of stone-throwing, some of blocking roads, etc. Despite being a minor, he was questioned in the morning following his arrest, without being allowed any sleep. He was denied legal consul even while his lawyer was present at the police station. He was denied his right to have a parent present during his questioning. He was not informed of his right to remain silent, and even told that he is “expected to tell the truth” by his interrogators. It was acknowledged by the interrogators that only one of the four interrogators was qualified as a youth interrogator. While the trial-within-a-trial procedure has not yet reached conclusion, the evidence already revealed has brought the Military Court of Appealsto revise its remand decision and order Islam’s release to house arrest. Over the past two months, the army has arrested 24 of Nabi Saleh’s residents on protest related suspicions. Half of those arrested are minors, the youngest of whom is merely eleven. Ever since the beginning of the village’s struggle against settler takeover of their lands in December of 2009, the army has conducted 71 arrests related to protest. As the entire village numbers just over 500 residents, the number constitutes approximately 10% of its population. Tamimi’s arrest corresponds to the systematic arrest of protest leaders all around the West Bank, as in the case of the villages Bil’in and Ni’ilin. Only recently the Military Court of Appeals has aggravated the sentence of Abdallah Abu Rahmah from the village of Bilin, sending him to 16 months imprisonment on charges of incitement and organizing illegal demonstrations. Abu Rahmah was released in March 2011. The arrest and trial of Abu Rahmah has been widely condemned by the international community, most notably by Britain and EU foreign minister, Catherin Ashton. Harsh criticism of the arrest has also been offered by leading human rights organizations in Israel and around the world, among them B’tselem, ACRI, as well as Human Rights Watch, which declared Abu Rahmah’s trial unfair, and Amnesty International, which declared Abu Rahmah a prisoner of conscience.